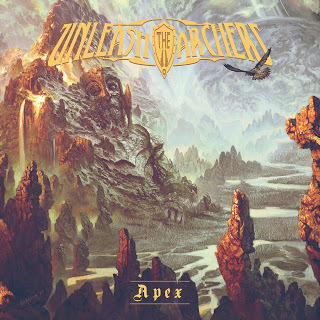 Despite the fact that Apex is the fourth full-length album of Canadian-based band Unleash The Archers, I didn’t know the band from one of their earlier albums. But I have to say, Apex was a great album to get to know them better. Many bands in the female fronted genre, which is a hideous term by the way, have the standard guitar riffs, keyboards, and melodic vocal lines. But with Unleash The Archers you sometimes think you’re in the 80s again. Sure, the opening song Awakening serves as a bit as a showcase song, where everything that this band is capable of comes together with grunts, heavy guitars and loud drums, making it a powerful heavy metal song. But when you listen to the second song Shadow Guide you can hear that Unleash The Archers is as a band that mixes metal and hard rock a little bit. And this is very refreshing. Being a fan of the 80s classic rock myself, I love to hear screeching guitars and a fantastic female vocalist, because that is what Brittney Slayes is! Sure, if you ask me her voice would’ve suited better in a hard rock band, but this also works like a charm. Throughout the whole album Brittney Slayes shows what she is capable of. Does the music of Unleash The Archers have no metal at all then? Of course it does! By adding grunts and tuning the guitars down, creating what we call in metal the devil’s tone, Unleash The Archers definitely brings the heavy metal to you! If you combine these metal elements with long screeching guitar solos and some 80s choruses, then you have a great band making great music. The next two songs on the album The Matriarch and Cleanse The Bloodlines really are powerful battle songs. They stand out from the rest and are among the better songs on the album. In the song Ten Thousand Against One you hear the very tight drums of drummer Scott Buchanan. I already said something about the great guitarists, Grant Truesdell and Andrew Saunders. They play incredibly good and have time for a nice long solo in almost every song. Furthermore, the title track Apex really stands out because, despite the fact that throughout the whole album I can hear that vocalist Brittney Slayes is really good, the quiet part of this song really shows how great a singer Brittney really is! I think that that is the only negative point I have of the whole album, I would’ve liked it if there were some ballads present. But I guess that’s a matter of taste. So, do you like heavy metal and are you just like me sometimes a little stuck in the 80s? Then Apex from Unleash The Archers is really your cup of tea! Read our review of their earlier album Time Stands Still here.